Everyone’s getting excited about US oil independence. Not so fast. 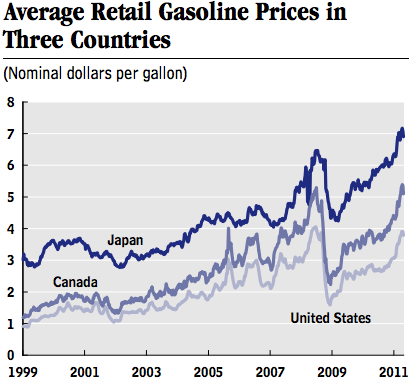 American presidents have been dreaming about "oil independence" since Jimmy Carter in the 1970s. This is the aim of having the United States fulfill all of its oil needs from domestic sources — and not be reliant on Saudi Arabia or Venezuela or anyone else. And it always seemed like an unattainable goal. Lately, however, energy analysts are taking that dream more seriously. On April 7, for the first time ever, the US Energy Information Administration said in its annual outlook that it was at least possible that net US oil imports could fall to zero by 2037. That's partly because the United States is producing a lot more oil these days — thanks to offshore drilling and new techniques like hydraulic fracturing. It's also because we're driving more fuel-efficient cars and light trucks. But does this mean US oil independence is — at long last — within reach, as many analysts have suggested? Not necessarily. For one, this new forecast depends on a lot of assumptions that may not pan out — like the idea that drilling technology will improve dramatically in the years ahead. For another, the United States is still going to be at the mercy of global oil markets for many years to come, even if oil imports do disappear entirely. Why the drop? The United States is producing more oil and gas than it has in years, in part because companies have figured out how to use fracking and horizontal drilling to extract energy from shale deposits. But, as the chart above shows, we're also using less oil. Americans have been driving less since 2005 for a variety of reasons. And people are buying more fuel-efficient cars and trucks — partly because gasoline is getting expensive and partly because the Obama administration keeps ratcheting up fuel-economy regulations. So that's the past. What's harder to describe is the future. That's why the new forecast from the Energy Information Administration lays out several different scenarios here. The "reference" scenario, in blue, is the base case for what the agency thinks will happen. That is, analysts think its perfectly plausible that the United States will continue to produce more oil domestically still import between 30 and 40 percent of its oil for decades to come, as oil production drops again. That's a shift from the past, albeit only a moderate one. But how likely is this? 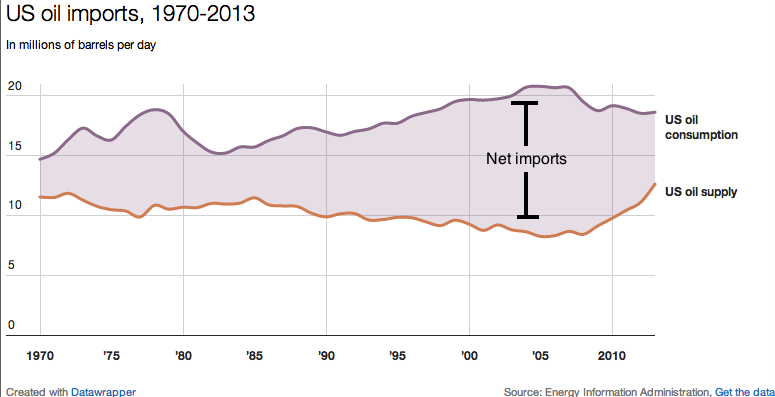 As the EIA explains at length here, you need to lay on a whole bunch of assumptions to get to zero net imports. Oil prices would have to stay high enough that companies find it profitable to seek out difficult deposits. Offshore fields in the Gulf Coast and elsewhere would need to have more recoverable oil than forecasters currently think — and these areas still haven't been explored very thoroughly. Drilling technology would also need to continue to improve, with companies able to pack more wells closer together in oil and gas fields. Some experts are skeptical that drilling productivity will keep improving so dramatically. Case in point: David Hughes, a geoscientist at the Post Carbon Institute, has argued that individual fracking wells are declining more quickly than people thought — which will make it harder to increase overall production. Other energy analysts think that oil forecasting is more akin to astrology than science, and we shouldn't put much stock in any medium-term predictions of these sorts. But the EIA, for its part, is essentially saying that it's been overly pessimistic about the ingenuity of oil and gas companies in the past. Every year since 2010, it keeps revising upward the amount of oil it expects the United States to produce. So, this time around, the agency is erring on the side of optimism. Now comes the disappointing news. Even if, one day, the United States produces enough oil to satisfy its own needs, it still won't be entirely "independent" from the rest of the world. That is, the US economy will still be vulnerable to supply shortages or turmoil in the Middle East (for instance). Another way to put this is that as long as the United States relies on oil to fuel its cars and trucks and airplanes, it will be affected by what happens in the global oil markets — no matter where its oil comes from. Now, that hardly means more domestic oil production is pointless. There are all sorts of other reasons to care about what's happening with oil drilling. More drilling can create more jobs. More domestic oil might mean a lower US trade deficit (although this is debatable). On the downside, more oil also might mean more carbon-dioxide emissions and more global warming (although a lot depends on whether countries like Saudi Arabia cut their own oil production in response). What's more, as Michael Levi of the Council on Foreign Relations explained in this old interview, perceptions matter in US foreign policy. If US oil imports shrink dramatically, a lot of policymakers and politicians might think we no longer need to worry as much about the Middle East. But that's a general guide for reading this new forecast. Zero oil imports are plausible, but far from assured. And true "oil independence" is still an elusive dream.